Adrienne Jacobson (pictured in the middle) is a fifth grade student at Miami Trace Elementary. Jacobson won first place for Fayette County in a contest hosted by RPHF Solid Waste District. 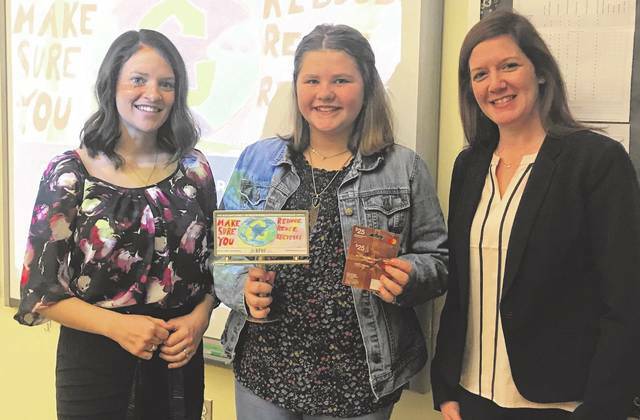 The contest involved fifth graders in Ross, Pickaway, Highland and Fayette counties creating an informative billboard to encourage recycling. As the Fayette County winner, Jacobson’s image will appear in April on the digital billboard at 1195 St. Route 22 West, near the Fayette County Fairgrounds. On Thursday, Erica Tucker and Lauren Grooms from the Solid Waste District, presented Adrienne with a replica of the billboard that she created along with a $25 gift card.